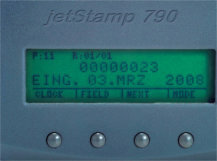 Reiner JetStamp 792MP InkJet Coding Printer is a printer for Date Number Coding, featuring 2-Line Ink Jet Printing WITH A Quick-Dry Ink for Metal, Plastic and Glass. Options for Integration with InLine Systems and Remote Operation Foot Pedal or Buttons. This model JetStamp 792MP (MP=Metal / Plastic) features a Quick-Dry, Permanent Ink and Firmware designed for use on Metal, Plastic and other slick surfaces, the ink will adhere to these types of surfaces!! Complete JetStamp 792MP InkJet Coding Kit includes; (1) JetStamp 792MP InkJet Printer with Quick-Dry Ink and Firmware, (1) Docking Cradle, (1) Power Supply, (1) Black Quick-Dry Ink Jet Cartridge, (1) USB Cable and Software CD. Applications: A solution for InkJet Product Coding and Marking...such as; printing part numbers or lot numbers and Expiration Dates, easliy imprint accurately and legiably, with no effort.